L'Astrolabe will sail on her first supply mission to the Dumont d’Urville station in Antarctica in winter 2018. Image: courtesy of Wärtsilä. L'Astrolabe polar logistics and patrol vessel was christened in July 2017. Image: courtesy of PIRIOU. The icebreaker vessel is powered by four Wärtsilä 20 diesel engines. Image: courtesy of Yann Gwilhoù. The L’Astrolabe Polar Logistics and Patrol Vessel was built by Chantiers Piriou shipyard in Concarneau, France. The vessel will be jointly owned and operated by the French Southern and Antarctic Lands (TAAF) administration, the French Polar Institute (IPEV), and the French Navy. It will provide logistics support to scientific bases in the Antarctic Ocean during the austral summer and will also conduct sovereignty and patrol missions in the exclusive economic zones (EEZs) of the French Austral territories. The polar logistics and patrol vessel (PLPV) is scheduled to be delivered in September 2017. It is planned to be deployed on its first supply mission to the Dumont d’Urville station in Antarctica, in winter 2018. L’Astrolabe will replace the L’Albatros patrol vessel and the L’Astrolabe polar logistics vessel. 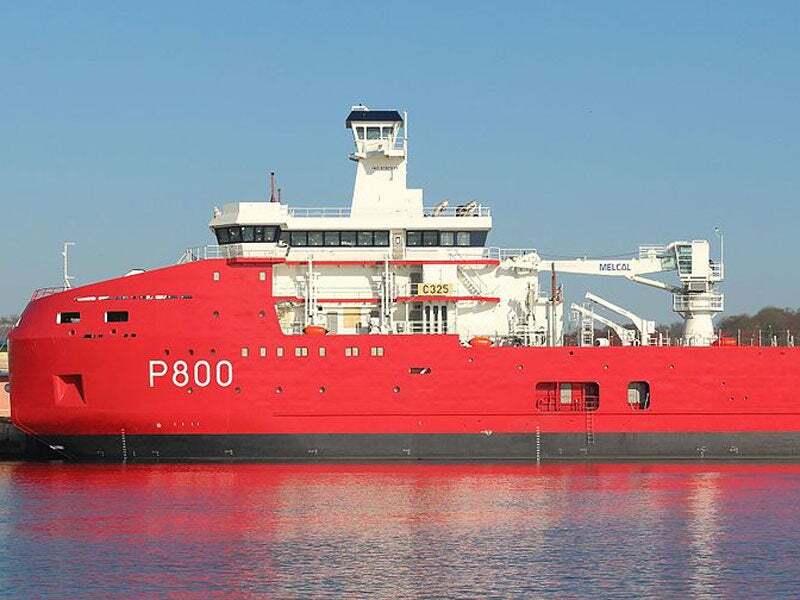 The Ministry of Overseas, France, placed a contract with Chantiers Piriou for the construction of a polar logistics vessel in June 2015. Aker Arctic was awarded a contract by PIRIOU shipyard to provide basic design for the ship. The contract also included the provision of on-site engineering support. Chantiers Piriou placed a contract with Wärtsilä to deliver propulsion solutions for the vessel, in November 2015. L’Astrolabe was launched in December 2016 and christened in July 2017. The polar logistics vessel was designed by Aker Arctic based on a concept developed by Marine Assistance. The hull and superstructure of the vessel are made of steel. Classified by Bureau Veritas as Icebreaker 5, the vessel can operate independently in ice with maximum thickness ranging from 60cm-80cm. It has an overall length of 72m, moulded breadth of 16m, draught of 5.30m, and a depth of 6.8m at main deck. The deadweight tonnage of the ship is 1,200t. The icebreaker is manned by a crew of 60. The deck of L’Astrolabe is installed with cargo handling equipment, including an aft crane with a lifting capacity of 35t at an outreach of 12m, and a fore crane with a lifting capacity of 900kg at 8.8m outreach. The aft deck also accommodates a gantry with a capacity of 5t. It also features an aft landing spot and a hangar facility to support the operations of two helicopters. The vessel has the capacity to store 150m³ of fresh water, 900m³ of usable fuel oil, and 500m³ of freight fuel. Its cargo deck can carry 14 containers of 20ft in cargo hold, and 40 20ft containers on the upper deck. The total freight carrying capacity of the vessel is up to 1,400t. The vessel is powered by four in-line Wärtsilä 20 main diesel engines driving two Wärtsilä stainless steel controllable-pitch propellers through two Wärtsilä reduction gears. Each engine develops a maximum power output of 1,600kW. The power-plant also integrates four Wärtsilä NOR emissions after-treatment systems, a 500kW Wärtsilä tunnel thruster, two 500kWe generators, and a 150kWe emergency generator. Wärtsilä’s NOR systems will enable the ship to reduce NOx emissions to meet the International Maritime Organization’s (IMO) Tier III emission standards. The propulsion system provides a maximum speed of 14kt and enables the vessel to operate in the most challenging ice and weather conditions. The high endurance of the ship will further enable it to conduct missions for 35 days at 12kt. FEROFORM and RAILKO are advanced engineering composite materials, exclusively manufactured by TENMAT, and are widely recognised as the industry standard for demanding applications such as stern tube, rudder and propeller bearings, steering gear, deck equipment, offshore and bitumen and asphalt tanker insulation and support pads. TENMAT RAILKO NF and FEROFORM T grades are approved and specified by navies worldwide for propeller shaft and rudder bearings in submarines. The industry leading materials offer reduced stick slip, improved fuel efficiency, lower vibration and reduced wear. TENMAT FEROFORM and RAILKO composite marine bearings are self-lubricating and can be used for replacing metallic bearings.